After the best season in franchise history, the Phoenix Coyotes lost their top offensive player this summer and might not have their captain and third-leading scorer back. General manager Don Maloney added Steve Sullivan and David Moss in free agency, and each could end up in a top-six role with Ray Whitney in Dallas and Shane Doan still unsigned. Maloney's best offseason acquisition could end up being Zbynek Michalek. While the GM has had to wait on a decision from Doan, he was able to take advantage of the Pittsburgh Penguins' desire to clear salary-cap space with Michalek and their decision to wait on the premium free agents to nab Sullivan. 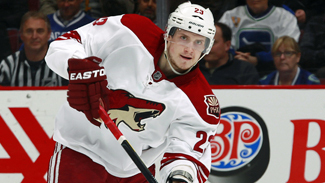 Under-valued: Oliver Ekman-Larsson – Emerged as Phoenix’s No. 2 fantasy d-man behind Keith Yandle and finished the season with 13 goals and 32 points. Has tremendous upside and should only improve going forward while seeing an increase in PP time (2:04 per game last year). Over-valued: Mike Smith – Still a very talented goalie, but don’t expect him to repeat last season’s heroics (38 wins, 2.21 GAA, .930 SV%, eight shutouts) as he’ll likely end up closer to his career 2.56 GAA and .914 SV%. Sleeper: Steve Sullivan – Veteran winger will likely find himself on top line with Radim Vrbata (replacing the 77-point Ray Whitney from last season) and could end up with a valuable 50-plus point campaign. Nick Johnson and Chris Conner also spent time in the past with the Penguins, though they came directly from the Minnesota Wild and Detroit Red Wings, respectively, and each could earn a full-time role with the Coyotes. Regardless of Doan's destination, the Coyotes are likely to be a scoring-by-committee crew, though the young, offensive-minded defense corps will likely lessen the goal-scoring burden a bit for the forwards. * - Chris Brown fills the void left by Raffi Torres, who will continue to serve the suspension he received for his hit on Chicago Blackhawks forward Marian Hossa during the 2012 Stanley Cup Playoffs. Torres will miss the first eight games of the 2012-13 regular season. NOTES: Should Doan return it would push Moss down the lineup. If not, this would be a chance for Moss to rebound while playing with two guys who performed very well during the 2012 Stanley Cup Playoffs. Given the suspension for Torres, the Coyotes could use that time to audition junior-eligible player Jordan Martinook, or give Brown or Brendan Shinnimin a brief trial before sending them to Portland of the American Hockey League. Michalek played almost exclusively with Ed Jovanovski during his last season with Phoenix, but he was paired with Yandle a little. Stone and Schlemko are just two of the guys who will be battling for the final spot on the blue line. Chris Summers and prospects Brandon Gormley, David Rundblad and Maxim Goncharov could all be involved. Don't be surprised if coach Dave Tippett is wary of Smith's workload early in the season and tries to spot in LaBarbera more after the backup went the distance in 13 games in 2011-12.